Filed to: Gilli-wha?Filed to: Gilli-wha? A financial advantage, superior networking, powerful backers, rural cred. Would you believe we're talking about a woman in politics? 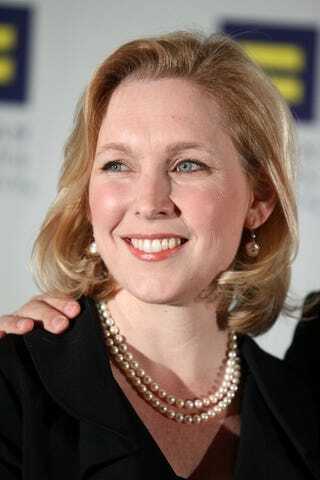 That woman would be New York Senator Kirsten Gillibrand, who was appointed by Governor David Paterson to fill Hillary Clinton's seat and has managed to maintain her advantage despite no great enthusiasm for her in the state. High-profile would-be opponents — both Republicans and Democrats — have all slunk away. She now faces what The New York Times describes as "only token Republican opposition." It has undoubtedly helped Ms. Gillibrand that her powerful allies, like the state's senior senator, Charles E. Schumer, and President Obama, have helped ward off potential Democratic challengers. But a more likely explanation is that Ms. Gillibrand possesses assets most of the aspiring senators lack. She has a legitimate geographic base, having represented an Albany-area Congressional district in a part of the state where her family is prominent. She has a network of donors, especially women, who are not going to abandon her. She has a commitment to working her tail off to keep the seat, a fact that even her political enemies grudgingly acknowledge. And, perhaps most important, she has $5.1 million in her campaign account. Whether you care for Gillibrand's politics or not, this is a nice inversion of the usual problems usually faced by women running for high-profile political office. She is benefiting from a network of donors, which includes powerful men as well as wealthy women. She is something of an insider pick, coming from a political family. And she has no problem putting herself out there and saying she wants this. Of course, none of this is enough to score a meal with Mike Bloomberg. But she's probably too busy anyhow.